While we were in town for the Big Apple Barbecue Block Party we recorded an interview with Mitchell Davis on his Taste Matters show broadcast every Wednesday on Heritage Radio Network. 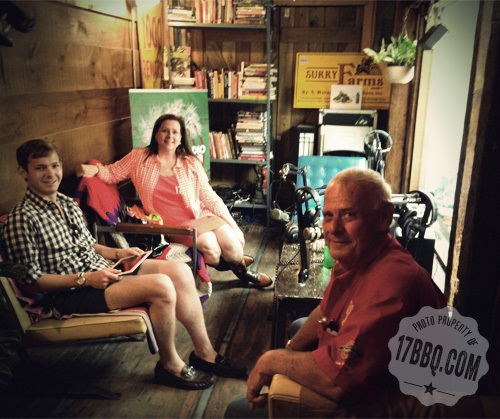 We talked about barbecue and its various nuances, regional styles, the Big Apple Barbecue Block Party, OnCue and the education/training we offer at 17th Street and a gave tips for great barbecue in your own backyard. Listen to the entire interview here. The unique studio is located inside Roberta’s, a trendy Bushwick pizza joint. The building is constructed out of shipping containers cobbled together with various found and reclaimed pieces of wood, metal, and other artifacts – kind of like the Brooklyn version of The Shed. A large window in the studio overlooks the light-filled back dining area of the restaurant. The diners could see us recording and our mouths were watering as we watched trays laden with food being delivered to table after table. We were happy to relax over a delicious lunch after the show. Please consider supporting Heritage Radio Network, the most progressive for food and culture radio in America. The membership-supported station is committed to archiving, protecting, and advancing our country’s rich food culture through programs that give voice to America’s leading food professionals, farmers, policy experts, artists, and tastemakers. If you’re in the New York City/Brooklyn areas, you might be interested in this upcoming Hawaiian Barbecue fundraiser, benefitting the station, on Sunday, August 11 in the back garden of Roberta’s. Thank you so much for inviting us, Mitchell. We were honored to be guests!